Please join us for today from 10:00 to 11:00 AM for the CrossFit Amundson Olympic LIfting Class followed by Open from 11:00 AM to 1:00 PM. A CrossFit Amundson Coach will be on staff to help with the accomplishment of your fitness goals. On Wednesday, May 14, 2014, Greg Amundson and Sammy Nigh of SurfTech had a meeting to discuss the forging of a new relationship between CrossFit Amundson, SurfTech and the awesome sport of Stand Up Paddle (SUP). CrossFit Amundson is now STOKED to announce that SUP will be coming to our gym in the form of a weekly workout that will culminate in the first official “CrossFit Amundson Waterman Competition” that will be a combination of SUP, ocean swimming, and dry-land CrossFit skills. Stay posted for more information on this exciting development. 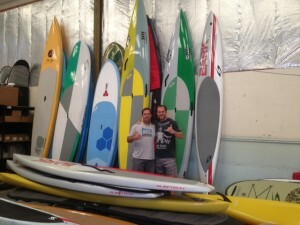 Special thanks to Sammy and our new friends at Surftech SUP.